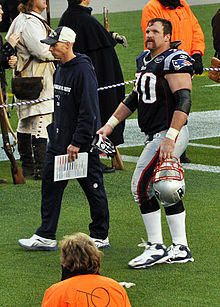 On August 10, 2011, Mankins signed a 6-year deal, which at the time made him the highest paid guard in the league. ^ Reiss, Mike (June 15, 2010). "Patriots' Mankins: 'I want to be traded'". ESPNBoston.com. Retrieved June 18, 2010. ^ "Pats guard Mankins ends holdout". ESPNBoston.com. November 2, 2010. Retrieved November 2, 2010. ^ Reiss, Mike (November 2, 2010). "Patriots will get 2-game exemption". ESPNBoston.com. Retrieved November 2, 2010. ^ "Patriots franchise OL Logan Mankins". FanHouse. February 15, 2011. Retrieved February 15, 2010. 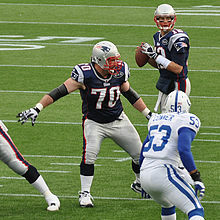 ^ "Report: Pats, Mankins agree on six-year deal". WEEI-FM. August 10, 2011. Retrieved August 10, 2011. 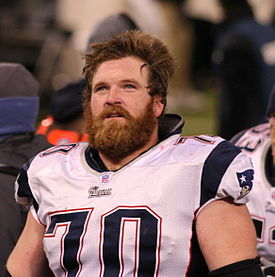 ^ "Logan Mankins Fined $10,000 for Clipping".